Country: Switzerland | Beer Apprentice - Craft Beer News, Reviews, Interviews and Info. Hello everyone. For today’s craft beer review I’m going to be trying the Biere Trois Dames Grande Dame (Oud Bruin) produced by the Brasserie Trois Dames located in Sainte-Croix, Switzerland. I don’t know much about this brew except that it’s supposed to be really good. Needless to say, I’m really eager to try it. The website, brasserietroisdames.ch, didn’t provide any information regarding this beer, so heck with it. Let’s just find out for ourselves, shall we? This brew had an ABV of 7.2% and it came in a 25.4 oz. bottle. It poured an extremely deep oxblood/red color with only a slight inkling of brighter ruby red highlights around the edges of the snifter. The crown was tight, compact, decently sized and light tan. Super smooth and actually kind of creamy. The retention time was solid and the lacing was well above average. It left a rather nice bit of foam sticking to the sides. The nose revealed touches of earthy sour notes. Hints of musty drift wood too. I swear I think I smelled blueberries and raspberries as well. Some other dark fruits were accounted for also. Black cherry, blackberries and plum. Very complex and very well balanced. I thought it smelled great. A lot more of the woody/oak was discovered in the taste. The sourness was not to be denied either. It was very prominent. More of those dark fruits too. Deep cherry, raspberry, blackberry and plum. I got a slight savor of caramel sweetness and dark bread too. It was somewhat acidic and vinegary, but it was easily manageable. Like the fragrance, the flavor was very complex and very good. The mouthfeel was medium bodied and dry. It began a touch sharp, however it smoothed out nicely after a few sips. The carbonation was good and a bit of warmth was felt after the swallow. A good deal of tastiness was left behind on the palate after each sip also. Man, I thought this was an excellent beer. It was kind of unique and different, yet somehow familiar at the same time. It has enough character to keep even the most advanced craft beer aficionado interested for the duration. It was fairly easy to drink too considering the style and all the complexities. 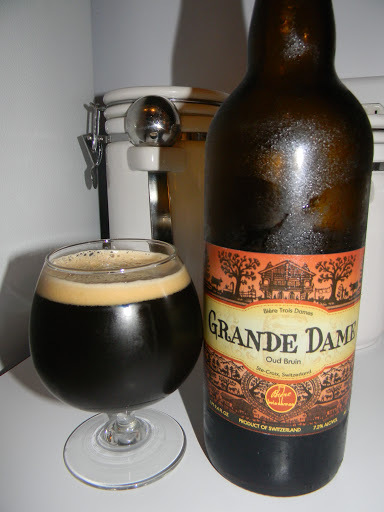 I’d definitely say give the Beire Trois Dames Grande Dame (Oud Bruin) a try if you are able to obtain a bottle. I think it’s a winner. It may not be a beer to drink every day, but every now and then it would certainly hit the spot. Have any of you guys tried this brew? What was your opinion? Leave a comment if you’d like. Thanks for checking back in on another review everyone. I really appreciate it. Hi guys. For today’s craft beer review I’m going to be trying my first ever brew from the Brasserie des Franches-Montagnes located in Saignelegier, Switzerland. 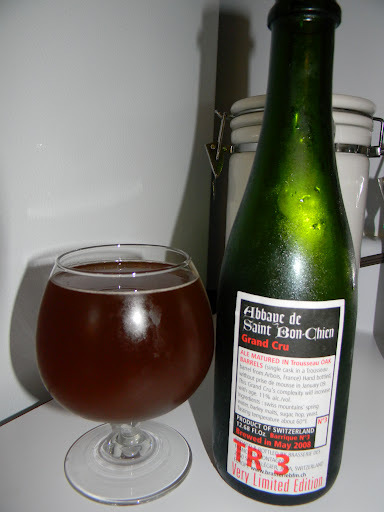 I have a 2008 Abbaye de Saint Bon-Chien Grand Cru in my possession and I’ll tell ya, I’m super excited about trying it. I couldn’t quite make out the commercial description from the website, brasseriebfm.ch, so I’m just going to copy what was written on the bottle. Ale matured in Trousseau OAK BARRELS (single cask in a Trousseau barrel from Arbois, France). Hand bottled, without prise de mousse in January 09. This Grand Cru’s complexity will increase with age. Barrique No. 3 brewed in May 2008. I can’t wait any longer. I’m ready for a sip. This beer came in a 12.68 oz. bottle with an ABV of 11.0%. It poured an opaque amber/caramel color with a ruby red cast when held toward a light source. It didn’t form much of a head with a very gentle pour. What foam that was generated was off white in color and fizzy. The retention time was non-existent and little to no lacing was left behind either. A ton of clear alcohol was left on the sides of the snifter when I tilted it however. A little bit of sediment made its way into the glass, but it quickly settled to the bottom. This brew had a flat-out gorgeous aroma. Extremely complex too. Hints of soured red apple skins as well as other soured berries (cherries and grapes). Only the slightest tone of alcohol was found and the oak was distinguished fairly easily with a gentle swirl of the liquid. A tad bit of funk was determined also, but it was very mellow and manageable. Only the most faint vinegar and acidity was found as well, however a solid backbone of bread and/or yeast pushed forward and gave it a bit of roundness. Wow!!! What a fragrance!!! One of the best I’ve ever smelled. The taste was very sour, acidic and tart on the initial intake. A lip puckering goodness of soured grapes and cherries. Very wine like I thought. Again, a solid backbone of fresh breads and yeast. It kind of tasted like what I would imagine baked whole wheat bread soaked in red wine would taste like. Toward the end the oaky/wood and funk really shone through and it did nothing but compliment the overall flavor of the brew. A beautiful and well balanced flavor profile to say the least. Awesome. The mouthfeel was medium bodied. Sticky and very dry with a sharpness at the beginning that gave way to a silky smoothness as the palate adjusted. The carbonation was very low and I received absolutely no heat or warmth whatsoever from the alcohol, which I found unbelievable considering the 11.0% ABV. An absolute ton of flavor was left behind for me to ponder long after each sip had passed. Man!!! This is a “world-class” beer if there ever was one. The aroma and taste were divine to say the least. This thing has to rank near the top of all the Biere de Garde’s produced. Granted, I haven’t even begun to try all that are made, but I positively loved this one. Even though the drinkability was rather good, it needed to be taken slowly, so as to let it open up a bit. It started crazy tart and sour, but mellowed so well and those complex woody, yeasty and funky characteristics stepped up to the plate and knocked it out of the park. 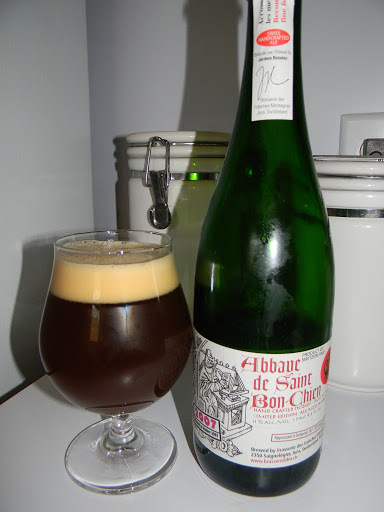 If you guys ever get the chance to try an Abbaye de Saint Bon-Chien Grand Cru of any vintage, I would highly recommend it. I have no doubt that it could appeal to both craft beer and wine drinkers alike. I have to give it a couple points just for the extreme rarity of it also. Have any of you guys ever tried anything from Franches-Montagnes? What was it? Did you like it? Feel free to leave a comment and tell me your opinions.